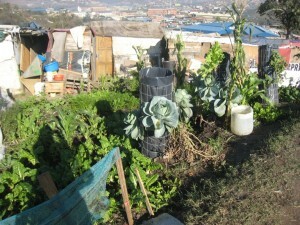 In response to the results of the Johanna Road Pilot Project, eThekwini Water Services (EWS) has decided to extend the project by 6 months so that Impiloyethu can continue onto the next phase in the Applied Health Education and Development (AHEAD) methodology, where graduates are invited to participate in weekly Food Security, Agriculture, and Nutrition (FAN) modules. These sessions stress the importance of proper nutrition – information which is much needed in informal settlements. In addition to weekly meetings, EWS’ Agriculture Management Unit (AMU) will be assisting the club with building a large communal garden across the street from the Johanna Road settlement. The project extension will also see the creation of an another CHC in the neighbouring settlement of Siyathuthuka, also located along Johanna Road on the way to the Northern Treatment Works. Siyathuthuka, home to approximately 600 households, is in need of health and hygiene training, as well as better maintenance of their communal facilities. 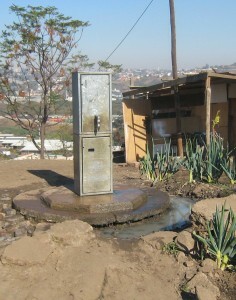 Despite being more than twice the size of Johanna Road, the community only has one container ablution block and four chemical toilets. The combination of a shortage of facilities and poor communal management has left the container toilets in a very unhygienic state. Grey water, illegal dumping, and open defecation are also problems within the community that the CHC will work to address. Impiloyethu members Nokuthula Mathetha and Nthabeleng Molusi, who have shown to be outstanding club members by their participation in CHC activities and acting as role models in the community, will be trained to be community facilitators for the new clubs.